'Mounted Police and Blacks' by Godfrey Charles Mundy, 1852. 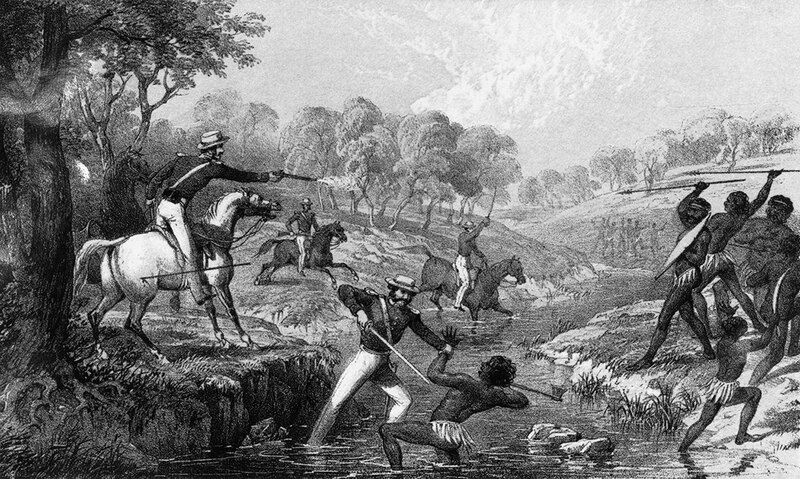 Welcome the the Australian Frontier Conflicts (1788-1940s) website. This website seeks to document the conflicts between European colonists and Australian Aboriginal and Torres Straight Islander peoples. WARNING: This website and links to other sources, contain images, names, or voices of deceased people in text, etchings, photographs, film, audio recordings, news media and printed material. The information on this website is publicly available. There may be copyright restrictions on some material depicted or referred to on this website, for example, images, articles, books, films, videos still subject to copyright. Please check the Australian Copyright Council's website at https://www.copyright.org.au for information about copyright in Australia and what publications are affected. TWITTER: There is NO Twitter account related to this website. Anyone wishing to contact Australian Frontier Conflicts can fill out the contact form on this site–click on the 'Contact Us' button at the bottom of this page, in the menu at the top of the page, or through the Facebook page linked to this site. While an updated version of this website is being developed, News posts are being added to the Australian Frontier Conflicts Website Facebook page. Click on the Facebook icon below to reach it.